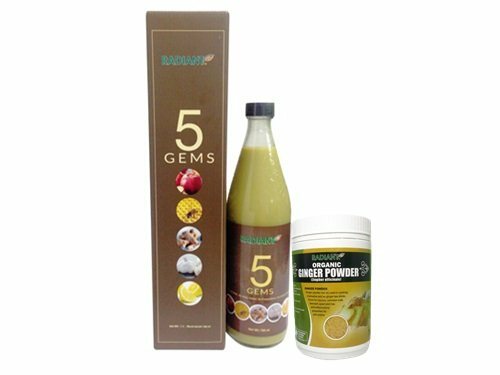 Set consists of 750ml Radiant 5 Gem Herbal Tonic and 200g Radiant Organic Ginger Powder. Radiant 5 Gem Herbal Tonic contains blended ginger, garlic, lemon, honey and apple cider vinegar. No water added. 100% natural ingredients and free from artificial flavourings and preservatives. Helps to maintain general well-being and weight management. Suitable for people with heart problems, poor blood circulation, high cholesterol, high blood pressure, cough and cold. Radiant Organic Ginger Powder helps with nausea, digestive problems, cold or fever. Add a teaspoon of ginger powder to you fruit juices or plain water and honey for warming effects. Product of India.